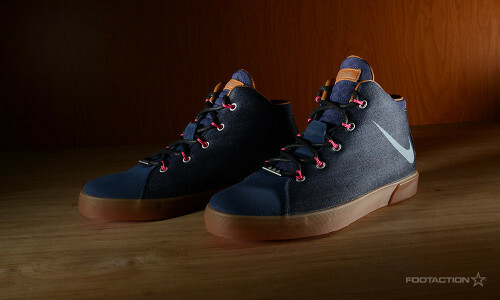 The Nike LeBron 12 NSW Lifestyle takes on a “Denim” aesthetic, which is inspired by the blue collar work ethic of LeBron James’ hometown. Flush with the headlining fabric making up the quarter panels, premium micro-suede adorns the toe and tongue. The silhouette’s Flywire lace eyelets pop with Fireberry while the vulcanized gum outsole caps off the sneaker. Last but not least, “330” is emblazoned on each heel tab which is the area code of Akron, Ohio. Available in stores Friday. Check out Release Locator for stores. Print article This entry was posted by hhcblog on December 17, 2014 at 4:14 pm, and is filed under Footwear. Follow any responses to this post through RSS 2.0. You can leave a response or trackback from your own site.